Facebook is the social media king that continues to rule over the entire marketplace. It is also one of the best places to build a community online, mostly because your audience is already there, waiting for your brand to show. There are all sorts of ways to improve the performance of your website and business. 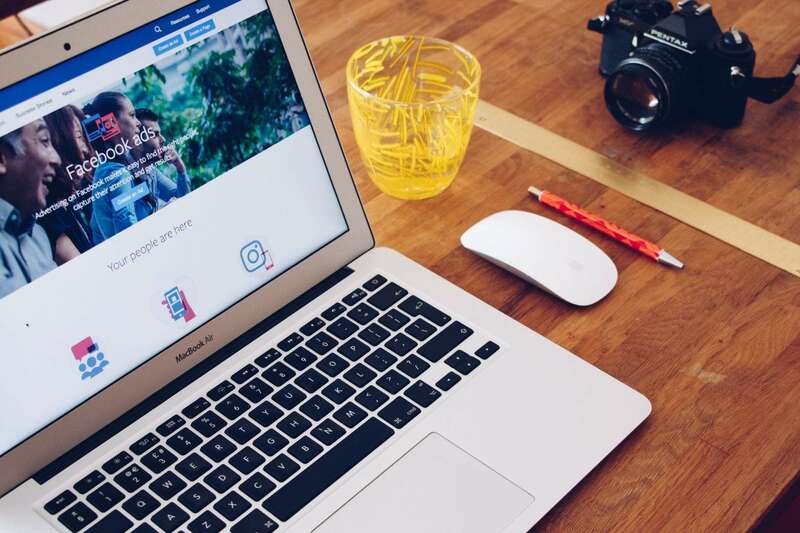 Facebook comes in handy, offering you countless opportunities to build a strong community that’ll be happy to engage with your brand and content. A person is much more likely to engage with you through a private Facebook group rather than through other channels like your website or blog. The reason is simple: when people belong to a private group, they’ll feel special, knowing that they’re receiving an exclusive value that very few people can get access to. Another huge benefit of developing a private Facebook group is the fact that Facebook sends new traffic to your group every day, organically, without your involvement. The moment someone tries to join, you can collect their emails and grow your email list automatically. And lastly, before I start with the practical how-to, I’d like to emphasize the fact that unlike with Facebook page posts, most of your private group members will be eager to consume the content that’s shared in the group. Well, in today’s post, I’ll show you how to start building and managing e a successful private Facebook group. Follow these strategies closely, add your own twists, and stay consistent. Starting a private Facebook group is very similar to starting a new website. You’ll need to figure out who will join, what content/value you’re going to consistently provide, and the reason why you’re developing it in the first place. If you have already decided your target audience and your blog is already running for a while now, you can skip the audience selection process. If you don’t, start thinking about your ideal group members. Who would you love to interact with? What do these people have in common? What do they want? What do they need? Your group is just like a never-ending meeting that keeps going until you let it. Therefore, you’ll only want to discuss with the right people. Once you figure out who you want to welcome inside, you’ll need to figure out what you’re going to give them. Brainstorm and analyze your ideal target audience’s needs, wants, problems, and needs, and you’ll know what to “serve” them. If you don’t know what they need, simply go ahead and ask them! Are you trying to create more engagement with your followers? Are you looking to establish yourself as an authority in the field? Or, perhaps, you just need a good place to promote your products and services? Regardless of your reasons, make sure that everything’s clear and set. You don’t want to mix up the objectives, otherwise, you’ll end up in a mess. 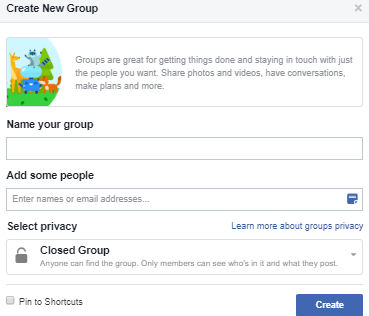 When you start a Facebook group, you’re required to add at least one friend from your list. You should add a close friend or a relative and let them know why they’ve been added. To make your Facebook group private, select “Closed Group” as a privacy measure. This will keep your group reachable and accessible when people search for it, but it’ll require them to fill out an application if they want to join. Of course, you’ll be the one who’ll address questions and approve or decline your group applicants later. I’d suggest you immediately create and publish an interesting yet professional cover photo for your group (Header). The ideal size of a group cover photo is 1640×859 pixels, this being ideal for mobile optimization. Concerning your main picture, upload a professional photo of yourself or insert your brand’s logo. Either way, keep it as professional as you can to ensure you’re giving the first right impression. Your main objective is to help everyone understand whether your group is able (or not) to satisfy their needs and solve their problems. Be very clear about your expectations – if you don’t want any type of promotions, make it heard in the description. The better you define your expectations the better the atmosphere of your group will get. Lastly, you can create a pinned post update that will serve as a “Welcome” post for your new members. Encourage them to read your group’s description and to introduce themselves properly. Your purpose is to make everyone feel like they’re true members of your community, so be kind and welcoming. If you’re not truly confident in your writing skills, you should probably take advantage of a cheap writing service to develop and craft your group’s description. You’ll invest a bit, yes, but in the end, your group’s image and reputation will be born intact and it’ll stay that way. As a group manager, your responsibility is to keep the place as clean and comfortable as possible. You should only allow people who are truly interested in your propositions, and you should be strict about accepting anyone else. The more “targeted” your group members are the more they’ll engage and contribute. Every prospect who wishes to join must have a Facebook account that’s at least 3 months old. They must have a real picture that shows their face. I quickly assess their Facebook’s profile (1 minute) to get more insights from their sharing behavior. There are a lot of clues you can get by simply looking at someone else’ news feed. If a person seems odd and you really don’t trust him/her, just say “NO” and move on. There will be plenty of “normal” people who will give you no struggles with the approval process, so focus on them! If you have a website and an audience already, pre-marketing your Facebook group is a great choice. Instead of simply launching it, you can build a little buzz around it, announcing a special event, contest, or prize for everyone who applies in the first days or weeks. For example, you can offer a special discount for your main products or promise to do a live video for the fans who are willing to fill out the group’s application and introduce themselves after. Promote this event on your list or on your website for a few weeks, right before you start the group. Establishing the approval criteria and the ground rules of your group is the first step. Making sure that everything runs according to the plan is the second. Delete the posts that are inappropriate or break the rules and remove the people who don’t respect your guidelines. Publicly intervene between other members who develop conflict, expressing your opinion and solution. Handle the sensitive conflicts by sending private messages. If you delete a post, make sure you let the author know why it happened and what he should be careful about in the future. Unless you want to spend the entire day moderating posts and creating engagement in the group, you’ll need to seek some help. Some of your most loyal brand followers will be happy to take on the role of “group leaders”, and you should be happy to let them help you. Many will do it for free, while some might request some compensation. Whatever you decide (to pay or not to pay) for help, you’ll absolutely need it in the long term. Reach out to your group members and make them this proposition, offering them whatever you believe to trigger their interest. If they agree, their role would be to moderate posts, ask questions, answer queries, and report back to you on a weekly basis. Finding the right people to join your community can often be a hustle, especially because of the strong competition across all niche markets. Obviously, you should always strive for quality instead of quantity. A big group of disinterested individuals will be way less valuable than a small group of highly interested prospects. Invite all your email subscribers – they already trust you, so let them know that new value is waiting for them in the group will get them to immediately join. Showcase your private group’s link on your website. At the end of your blog posts, make sure you drive your readers to a “private experience” by letting them know of your group’s unique value proposition. Invite your Facebook friends to join – this is obvious. Go through your friend’s list and see who might be interested. Develop and advertise a targeted contest – think of a prize that would satisfy your ideal group member and organize a contest around it. For example, whoever joins your group has the chance to win X or Y prize. Promote the post with Facebook ads to the most relevant audiences and watch the requests coming! Promote it on similar yet non-competitive Facebook groups – If, for example, your private group talks about “Pet Food”, you can go to relevant groups that are more general (Animal protection, Animal food, Animal health groups, etc.) and promote your private group there. Don’t be spammy. Try to add value to various discussions and don’t be intrusive while posting your link! If you’re doing it right, a private Facebook group can turn your random visitors into loyal brand advocates. Strive to connect with your members, help your members connect with one another, and provide as much value as you possibly can. Keep the atmosphere right and help everyone interact. The better experience you offer your users the more they’ll come back to engage! Susan Saurel is a passionate writer from Texas and a teacher by profession. She loves traveling and she also writes content for EssayWritingLand. Susan is also a project manager in an IT company and a lovely mom. She likes sharing her experience with readers and she has more to say, for sure.